This great little central city studio with awesome sea views and a balcony is really well located in the heart of Auckland City. Perfect for singles/couples and within walking distance of the best bits of Auckland City. The University is across the road, Spark Arena is nearby, you can take a short stroll down to Britomart or the waterfront and of course enjoy the many amazing bars, restaurants, cafes and shops that Auckland has to offer. This perfectly formed studio has everything that you need for a great time in Auckland City. It has a balcony with amazing harbour views and a small kitchen with microwave oven, hobs, fridge, single dish-drawer, tea and toast facilities. The comfy queen size bed with quality linen ensures that you have a comfortable stay and good nights sleep. It is east facing so you can enjoy the lovely morning sun and sea views from the balcony. This private apartment is located within The Quadrant Hotel building so you get to enjoy the great facilities of a 4 star hotel including spa pool, gym and restaurant. The location is perfect and very close to everything in the central city. The University is across the road, Spark Arena is nearby, you can take a short stroll down to Britomart or the waterfront and of course enjoy the many bars, restaurants, cafes and shops that Auckland has to offer. Parking is available for $20 subject to availability and must be booked ahead of your stay. The key is collected from a lockbox (a 3 minute walk). We find this works well as guests tend to arrive at various times throughout the day. This private apartment is inside The Quadrant Hotel building but not part of the hotel, hence guests must contact us for any issues not the front desk. We are strictly non-smoking ($1000 fee for breaches). Modern, comfortable and very quiet. 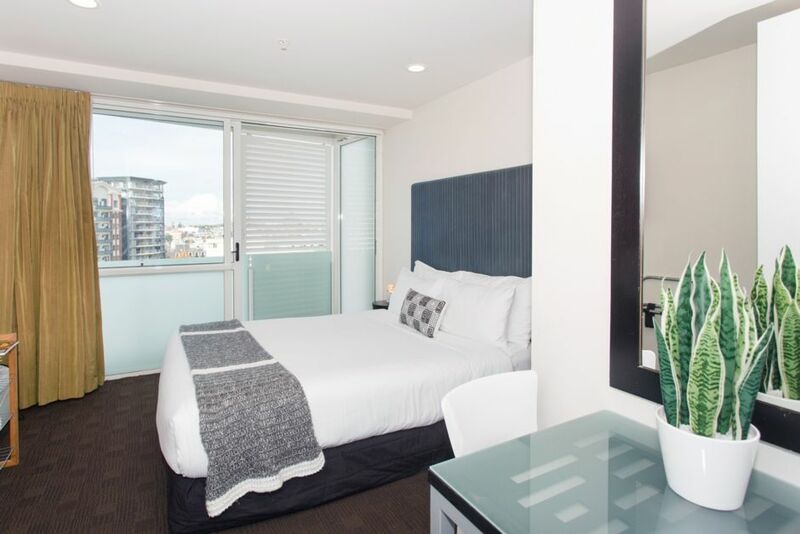 Perfectly located for a great stay in Auckland City. It was great when we arrived to find a cold beer in the fridge. Life saver!! The only criticism I have is the hair dryer didn’t have a guard on it and it sucked up my hair which was very distressing as I had to chop a chunk of my hair! Thank you for staying with us and also for your comment. We are very happy to read that you enjoyed your stay in our lovely place in Auckland. Sorry to hear about the hair dryer, we will replace it. Very clean, if compact, apartment with a nice view. Good location (on top of one of the many hills of Auckland). All the appliances you could need - appreciated the washer/dryer. Lovely, welcoming snacks and beverages to make us feel right at home. A cosy nest for our stay in Auckland. A small but cosy appartment very suitable for a short stay in Auckland. Within walking distance of the ferry building in the port and the Auckland domain with it’s Auckland Museum. Clean and well kept. Need to drop off your bags first as the car garage is about 5 min walk away and up a hill. Location was great with easy access to activities. Location was great with easy access to activities. Appartment is very small. It is a hotel room that has been converted to studio appartment. When we arrived there was a basket of snacks and beverages on the fridge and the was awesome after a long day of travel.. Appartment was very clean and you can’t beat the price. Overall a good experience.